Bee colonies have large populations, many tens of thousands of bees in the summer. The bees are packed into the hive, so a disease, or a parasite, will find it easy to spread, if once it gets into a beehive or gets a foothold within. In the 1990’s a parasite of bees in south east Asia was mistakenly introduced to the UK. This parasite, a mite (something like a tiny spider) called ‘varroa’, has had a devastating effect on British beekeeping. Not only does the mite harm adult and young bees, it spreads viruses through the bees and to make matters worse our bees have no natural defences against the mite. It is thought that a population of mites in the few thousands can kill a colony of bees. I checked our bees recently for these mites. 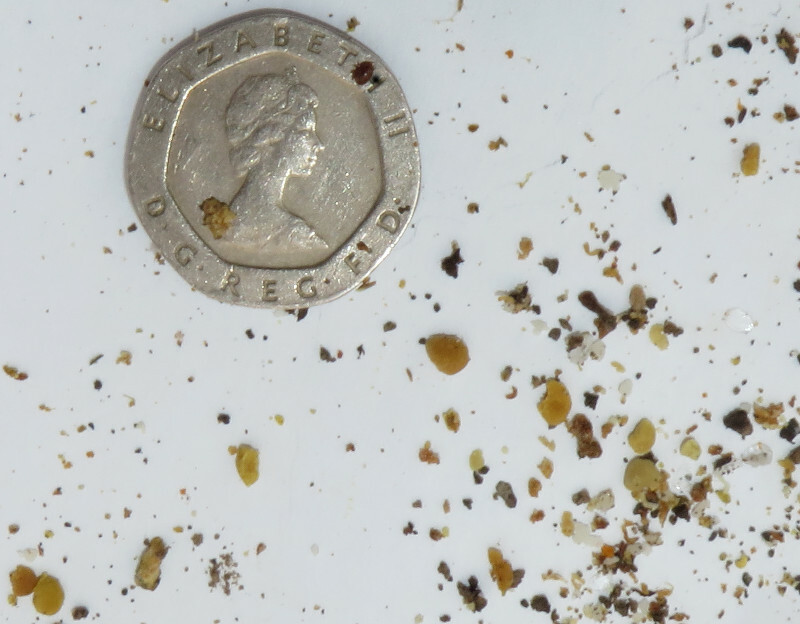 The pictures shows a varroa mite on the 20p piece (more detail about the picture below) it’s not surprising to find them, what we have to do is keep their numbers under control – the mite is tiny, perhaps a mm across, but actually quite large compared to a bee. The first thing to do is work out how many mites there are – so we can know if the numbers of them are harmful. This can be estimated from the number caught per day when they die and fall out of the hive. I caught 7 in one day, but only under a half of the hive so perhaps 15 died. To get an idea of the number of mites in the hive it is suggested that number is multiplied by 20-40 which would mean perhaps 300-600 mites – a low numbers but not insignificant because varroa mite can multiply fast in the spring. But, I have to make an admission because, at the moment, the bees are being treated with a chemical to kill mites. So, the question is, are the mites the last few being killed or are there a lot of mites in the hive and the chemical not working (because varroa mites have, over several years, become more and more ‘resistant’ to chemicals)? Time will tell. The treatment finishes in a week or so and then if mite fall rate slows the bees are ok but if it stays the same the hives may need further treatment. Keeping bees healthy when they have Varroa mites is a difficult thing to do, it’s without doubt the most difficult problem beekeepers face. Oh, and the picture. Well, the mite is the red dot on the 20p and you can just see its legs, the yellow ‘lumps’ are pollen, also just visible (if you look very carefully far middle right) is a transparent ‘wax scale’ one of the huge numbers that the bees produce to make honeycomb, and various bits of hive debris.